It was that time year again: trees began to shed their leaves and moms frantically buttoned their kids up in big coats. In crowded gyms across Northeast Ohio, wrestling season had begun. Bison wrestlers anxiously waited for their names to be called to the mat. Beachwood, the smaller and less experienced team, was the clear underdog to Kenston, a well-established team. The match was scheduled in the middle of the school day. Kenston’s entire student body was in the stands, staring menacingly at the Beachwood wrestlers. “We were the guinea pigs,” recalls Domenick Iammarino, Beachwood’s head coach at the time. The first Beachwood wrestler called to the mat was 103 lb. sophomore Marc Bilsky. Kenston’s wrestlers were soon to be surprised by Beachwood’s preparation. Bilsky managed to pin his opponent with a cradle. “I will never forget that pin,” Iammarino said. “We won the first three matches, and Kenston was shocked,” Iammarino added. Although Beachwood’s wrestlers ultimately lost to Kenston that day, they proved themselves worthy opponents. It was the first match of the 1965 season, the first for Beachwood’s brand new wrestling team. 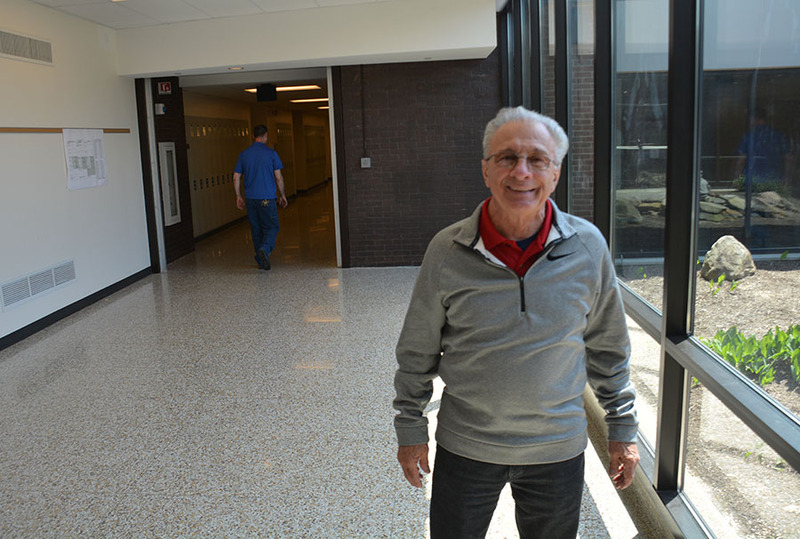 76-year-old Iammarino has taught and coached at BHS for over fifty years. He taught introduction to business, business law, typing and driver’s education. After retiring as a full-time teacher in 2003, Iammarino has been working as a special education assistant. But he is most well-known for his work as a coach. Today, Iammarino, or ‘Coach I’ as his athletes refer to him, continues to serve as asst. coach for middle school wrestling and head coach for middle school cross country. Iammarino’s greatest accomplishments were achieved during his time as head wrestling coach at BHS. He is regarded as the ‘Godfather of Beachwood Wrestling’, according to his bio on the Beachwood Schools web site. Iammarino has been involved in wrestling for most of his life, but he didn’t start wrestling until the 1957-58 season, his senior year at Cleveland’s Collinwood High School. “I only wrestled one year in high school, and the reason for that is–and this sounds crazy–I played basketball,” he explained. “I was pretty good at basketball. So Iammarino gave it a try, and he had a respectable season. That experience whet his appetite for the sport, as he continued his wrestling and academic career at Kent State. Iammarino did not immediately go into teaching. He was hired at Beachwood largely by chance. Around the same time, Beachwood called John Carroll with a job posting for someone who could teach business and coach wrestling. The placement officer knew just the right guy. It was 1965. Beachwood’s Athletic Director Ryan Peters (class of ’92 alum) explained what Beachwood wrestling was like before Iammarino arrived. After the 1964-1965 season, Iammarino was hired to start an official team. During Iammarino’s years as head wrestling coach from 1965 to 1986, the team had numerous honorable achievements. Just six years after the program was established, Beachwood wrestling had their first State Qualifier and Placer, then 105 lbs. Senior Ron Madow. One year later, Iammarino shepherded his first State Champion to the title, then 126 lbs. Senior Mark Hawald. During Iammarino’s time as head coach, he was named “Greater Cleveland Coach of the Year” in 1976 and again in 1980. In 1978, Iammarino was named “Ohio’s Coach of the Year”. 1975 graduate Peter Cimoroni, who wrestled for Iammarino, became assistant coach in the 1978-79 season and was Beachwood’s head wrestling coach from 1987 to 1992 and 2014 to 2017. Cimoroni stated that, although his coaching methods sometimes diverge from Iammarino’s, the basis of his method can be traced to Iammarino’s approach. Iammarino retired as Beachwood’s head coach after the 1983-1984 wrestling season. Iammarino explains that after his year as assistant coach at John Carroll, he was offered a position to coach wrestling at Brush High School. Iammarino was head wrestling coach at Brush from 1985 to 1992. “After teaching at Beachwood all day, I would go to Brush and coach wrestling [there],” he said. During Iammarino’s time at Brush, the Arc wrestling team won several championships and a respectable number of wrestlers went on to compete — and many to place — at the state tournament. However, Iammarino was abruptly non renewed at Brush after the 1991-1992 wrestling season. “Brush hired a new football coach, which had nothing to do with me, but he brought in one of his assistants to coach wrestling,” Iammarino explained. Although Iammarino wasn’t coaching at Beachwood, he was teaching a variety of classes. One of these was a typing class, which Ryan Peters happened to be in. After coaching at Brush, Iammarino went on to become the head wrestling coach at Orange High School for the 1992-1993 season before returning to Beachwood as asst. coach. Also in 1992, Iammarino was inducted into the Ohio Wrestling Hall of Fame. Ryan Peters’ brother Scott Peters coached the Beachwood team at the time. He invited Iammarino to come back and work with him as assistant coach for the 1993-1994 wrestling season. Thus, Iammarino resumed his role as a Beachwood coach. One of Iammarino’s most successful wrestlers during his second round as head coach was 2006 graduate Kevin Lipp. According to Lipp’s bio on the Beachwood Schools website, he is regarded as “one of Beachwood’s most accomplished wrestlers in school history.” During his freshman year of wrestling, Lipp won the Division III State Championship at 112 lbs. During his sophomore and junior years, Lipp placed 3rd in the Division III State Championship at 112 lbs. and 135 lbs. respectively. Also, during his junior year, he won the NHSCA Junior National Championship, which is considered one of the most prestigious wrestling tournaments in the Country. In his senior year, Lipp won the Division III State Championship at 140 lbs. and was voted Division III Wrestler of the Year. In his high school wrestling career, Lipp was a four-time team MVP, two-time District Champion, four-time member of Team Ohio’s National team and had a career record of 151-15, placing him second on the all-time Beachwood win list in wrestling. Lipp explained how Iammarino introduced him to wrestling at a young age. Lipp explained that Iammarino would personally help him in wrestling during his middle school days. Iammarino’s story as head varsity coach ended after the 2004-2005 wrestling season. After his two goes as head varsity coach, Iammarino has totalled an astounding 30+ years as the position, and has the longest tenure of any coach in Beachwood history. s achievements as coach include coaching 12 State Wrestling Champions and 72 State Place Winners/Qualifiers. His teams also won the Metropolitan Area Conference (MAC -8) in 2002, 2003, 2004 and 2005. Since Iammarino’s retirement as head coach in 2005, he has worked as head coach and assistant coach for the middle school wrestling team. Also, Iammarino has been helping out with other sports such as the middle school cross country team. However, Iammarino’s life has also been struck by tragedy. On the morning of Feb. 27, 2012, his grandson, 16-year-old Daniel Parmertor, was one of three students gunned down at Chardon High School. In an interview with the Beachcomber in March 2012, Iammarino explained what that day was like. Despite the adversity that Iammarino has faced after the death of his grandson, he has prevailed since and has been focusing on what he enjoys in life: coaching. Coach I. is a really great guy! Coach I was a great role model for me. He was passionate, he pushed us hard, he loved his work and the wrestlers and he always showed up for us. He was a great storyteller and we shared many laughs. He fostered a wrestling team family. It’s good to see that many other wrestlers had a chance to learn from Coach I as I did. Never had Coach I as a teacher or Coach, but he cared about his students like they were his own children. Coach I is one of the nicest teachers/coaches I have ever met. Great sense of humor, was very helpful, well rounded, and very approachable. I can’t think of anything negative about Coach I. Coach I has such big heart, and he is tough when he needs to be. Last time I saw Coach I, was on the Green Line Rapid after the 2016 Cleveland National Air Show. I said my condolences to his grandson, and told him I lost my father a year before to pancreatic cancer. He felt absolutely terrible. He told me, “Losing a loved one is hard, but you got to move on, but never let their memory fade.” Coach I is a very wise man, as he always had great advice. Coach I, there is not enough words to describe how awesome you are! I love Coach I. He was my typing teacher in 1976. My nephew’s are Jordan and Kevin Lipp and Coach I was instrumental in both of their wrestling career’s. He is not only a terrific coach, he is a phenomenal person who is loved and respected by everyone who has the honor to know him. When reminiscing all my memories revolving around my experiences with Coach I, I could honestly write a book! They are the roots of many important things that have become a foundation for much of what I have accomplished and what I am proud of as a man. To try and synthesize it best, I will reprise a portion of my recent induction speech given when being inducted into this year’s Beachwood’s Gallery of Success. …Then there was Mr. Domenick Iammarino, better known as “Coach I”, who more than my business and typing teacher, was also our very successful wrestling coach. In my sophomore year, he recruited me as his team’s manager. You see, Coach I needed one – and because of his reputation, I wanted to see what I could learn even though I had no real interest in becoming a wrestler. I was in the early years of my career as a competitive cyclist and cross country skier. In short… through Coach I, I learned what it looked — and felt like to really commit yourself to something – To work hard and smart. And, no matter how good you are – or think you are… digging deep into strengthening your weaknesses pays rewards. Since then, every team I have ever earned a spot on and with every coach that has ever coached me, the lessons I learned under Coach I -have always resonated with me and has followed me in so many aspects of my life. So, Coach I, I thank you. Well deserved article and praise for Coach I. He is an excellent coach and example. I have coffee with Dominick 2-3 times a week and let me tell you something, he is still as passionate as ever about the sport. He remembers everything from the 70s to the present. He recently recruited me to coach at bhs and he’s still in the room everyday Yelling and hollering demonstrating the moves. Coach “I” one of a kind. Coach I was a great inspiration to anyone who wrestled at Beachwood. He really taught the fundamentals well and when I had the opportunity to Coach in Florida I took most of his warm ups and techniques and applied them to my teams. Wrestling will forever be a part of my life and I thank Coach I for guiding me during my HS years and making such a lasting impression. Thanks Coach I you deserve all of the accolades for your historic career. Dim, you taught m a lot! You don’t probably know much about me and maybe don’t even remember me, but I can tell you, what I would have become versus what I have become is a lot due to you, so let me just say THANK YOU! Ps: Wrestled after HS at #2 ranked NAIA College in Wrestling in Colorado. Pinned a 440 lb man in 11 seconds record…… I did ok! Even got to wrestle in Aims IOWA with Chris Taylor….another 440 lb man…..and he chewed me up! Hated the warts on his neck! Thanks Dominic!